« Mister Freedom® Californian LOT.44R, 13 Oz. selvedge denim twill, NOS Cone Mills, made in USA. 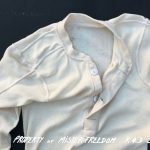 Mister Freedom® “G.I.” Two-Button Shirt, NOS indigo cotton rib knit. FW2018 Sportsman catalog. Made in USA. 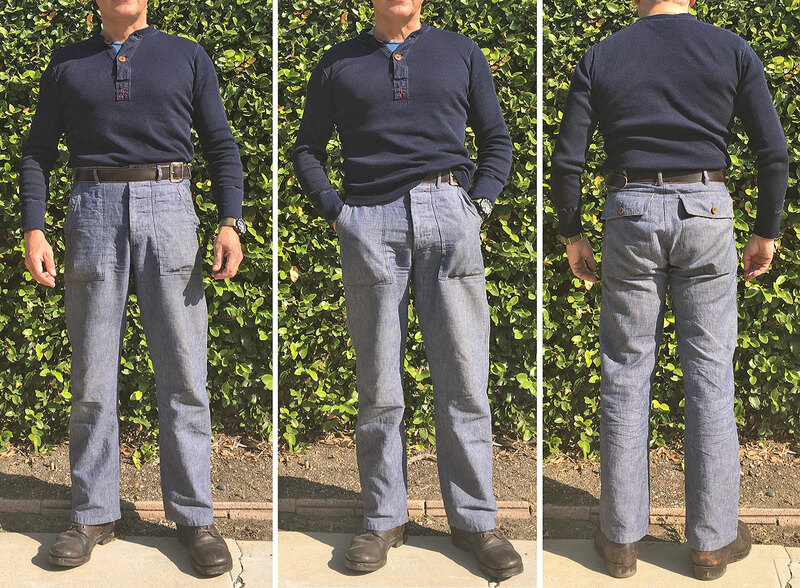 Mister Freedom® “G.I.” Two-Button Shirt, NOS indigo cotton Fisherman’s rib stitch jersey knit. “The Sportsman” catalog, Fall 2018. 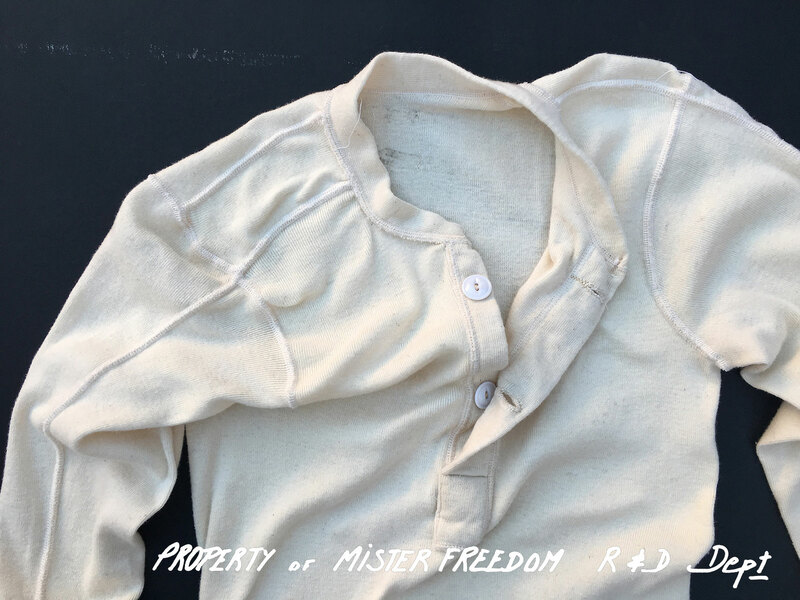 In true Mister Freedom® fashion, we will “render unto Caesar the things that are Caesar’s” and duly credit Uncle Sam for the pattern of this garment, as we shamelessly lifted this “henley” shirt design from a US Government-issued cold weather classic from the 1950’s. Initially released under the “Undershirt, Winter, M1950” moniker, it is sometimes referred to as the “Wallace Beery” shirt. The M-50 (model 1950) was adopted by the U.S. Army QMC in 1948, and, starting in 1950, a set of three shirts was issued to American soldiers heading out to Korean battlefields. 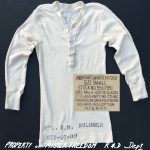 We are all familiar with the original military version, the unbleached wool merino-cotton blend knit shirt with the two large white buttons, and its superseding brown 436 issue, both quite a staple of old-school Army/Navy surplus stores. Original vintage US Army M-50 undershirt. Following our typical modus operandi, we decided to “civilianize” this classic US Army undershirt. 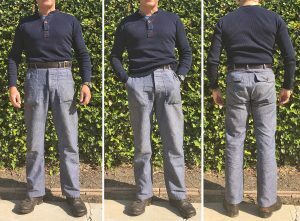 For a fashionable make-over, we tapped into the final precious yardages of New Old Stock indigo cotton jersey, the handsome deep dark indigo blue yarn-dyed 100% cotton “Fisherman’s rib stitch” jersey knit, milled in USA, previously featured on the MF® Chandail Saint-Malo. The technical knitting term “Fisherman’s rib stitch” refers to the fabric’s specific weave, displaying a vertical pattern of fine ribs, with somewhat of a ‘waffle’ aspect reminiscent of vintage thermal shirts. For the button placket, departing from the original M-50 military design with its simple matching knit placket, we decided to spice things up with extra indigo goodness. Although not quite visually noticeable at first glance, the placket is cut from a contrasting NOS plain-weave fabric, of an almost matching dark indigo color. This not only makes the button front closure sturdier than the loose-weave jersey, but also creates an attractive subtle contrast in both texture and color, promising of an interesting patina down the line. Like the military original, our “GI” indigo shirt features the characteristic utilitarian flatlock stitch overall construction, the stretch-resistant reverse weave top shoulder gusset, the unusual inverted top seam arm stitching, the wide self-fabric cuffs, and the two ‘oversized’ cat-eyes buttons. We opted for fancy corozo wood for our version, in a complimenting rich amber brown color. Just like with the production of the Saint-Malo, the specific horizontal mechanical stretch combined with fabric shrinkage made manufacturing the GI shirt a tour de force for our local factory. It took nearly one year of challenging sample-making and pattern-adjusting to get the fit, stitching and proportions right. After all that R&D challenge, we are quite ecstatic to finally add this little guy to the ever-growing MF® Sportsman catalog. Style-wise, our “G.I.” Two-Button Shirt is quite versatile and can be worn as a thermal-type undershirt, as a single-layer shirt, as a light sweater over a summer-weight button shirt, like a Nixon chambray for instance. Tucked-in old-man style to compliment the classic wedgie look dear to our model, or untucked, for the younger crowd. As always, our shirt is not available factory distressed. The subtle and attractive heather quality of the deep dark indigo will intensify as the garment fades with normal wear/wash cycles. See photos featuring a well-worn and frequently-washed early prototype, next to the freshly-issued version, for the rewarding results of naturally faded habiliment. Well, we picked up where they left off, and happily played with their unwanted toy! One of the perks of being part of a small independent label, is the reassurance of a bright, responsible, adult audience, such as the one we have been cultivating for the past 12 or so years. We are so indebted to our customers for the opportunity and privilege to design all sorts of challenging, eclectic, offbeat wearables, seasons after seasons, sustainably and regardless of trends. Thank you all, Mister Freedom® ❤️ you! CAVEAT EMPTOR: Although the indigo connoisseur will relish in the deep dark tone, the MF® “G.I.” shirt might not be an ideal garment for the faint-hearted or laundry-challenged. Indigo crocking will perdure even after several wear/wash cycles. I’ve had a blue torso from wearing mine without an undershirt! The shirt’s indigo blue will definitely rub-off on light-color garments, sofas, car seats, walls, skin, etc… Color transfer should easily wash-off with regular laundry methods, but we definitely recommend not wearing white undershirts, white shirts or white jackets with this garment for a while. Indigo color transfer will eventually subside after about 10 wear/wash cycles, and the knit fabric settle to a beautiful typical indigo hue. * An original MF® pattern inspired by vintage 1950’s Government-issued US Army M1950 two-button front cold weather undershirts. * MF® Sportsman trademark contrasting green inside stitching. I wear a Small in Stanley and Skivvy, and usually Medium in mfsc button shirts. I opted for a size Small in the GI shirt, with a snug initial fit that loosened-up gradually while wearing the shirt. After a day of normal wear, the shirt’s body expands a few inches in width, minimally in length. If the pattern has been specifically adjusted to avoid an unattractive “boxy” silhouette, a Small in the AM feels somewhat like a Medium in the PM. Basically, the GI shirt will shrink to a tighter fit after laundering/heat dry, but easily expand again with wear as the knit fabric loosens up. If you are in-between sizes, or worried about an overly-relaxed fit, we recommend sizing down on the GI shirt. As always, which size will work for you depends on your own aesthetics, body type, preference for ‘vintage’ silhouette or contemporary fit. Refer to sizing chart for measurements, taken with the item laying flat and NOT stretched. Do keep in mind the mechanical stretch aforementioned, and expect the shirt to gain an inch or two in width as it is worn and naturally stretched over the torso. Mister Freedom® GI Two-Button Shirt, size SMALL (washed/dry).